Soup is a versatile dish that is loved by many. 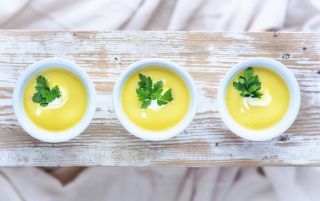 Whether it’s a healthy lunch, your choice of appetizer or comfort food when you’re under the weather, there are many different soups to tickle our taste buds. However, with our never-ending daily commitments, chopping endless amounts of veg before standing over a steamy pan to ensure you don’t burn your broth may be the last thing on your mind. Rather than being tempted by tinned soups that are full of salt, why not invest in a soup maker that can take the hassle out of home-cooked meals. If you’re on a diet or find you never have time to stop for a healthy lunch, then a soup maker is the answer to all of your problems. With this handy little gadget, you can mix your 5 a day into a batch of tasty soup in no time at all. Similar to a blender, the best soup makers are compact gadgets that fit nicely on your kitchen countertop and include a heating element that will cook your soup in around 30 minutes or less. If you’re just looking for something that is quick and easy to use, a basic soup maker will cost around the £50 mark. These normally require minimal fuss setting up and are pretty intuitive. If you’re a real foodie and want a soup maker with all the mod-cons, then these come around the £100 mark. The more expensive gadgets will have a range of functions that allow you to control consistency for a creamier broth or pre-set programmes to ensure you pack the most flavour into your soup. For those always on the go, look out for soup makers with a keep warm function and ones that are low maintenance and easy to clean. In terms of sizing, 1.5 Litres will get you around 4 servings; perfect for all the family. If you’re trialling the ‘soup diet’ or simply want an easier way to pack in your 5 a day, then this Morphy Richards Soup Maker is a great option for daily use. Not only does it make soup, but you can also ramp up your fruit intake by using it to make smoothies. We love this product as it allows you to control the consistency of your soup so you can make thicker broths in the winter and lighter soups in the summer months. You’ll also get a recipe book included to try out new flavours. This is a family sized blender that would look great in a big kitchen and makes a delicious array of soups, sauces and smoothies. It has a number of functions including rapid heat, sauté, boil and simmer, which creates the most flavoursome dishes. This blender is very low maintenance with a non-stick base and a self-clean feature to make cooking even easier. Although it states a capacity of 1.75L, hot liquids can only be filled up to 1.4L. However, this is still on our list as one of the best soup makers for big families. They say a watched pot never boils, so don’t waste your time standing over a simmering pan when you can invest in the Tower Health Soup Maker. Although the cheapest on our list, this gadget is powered by a whopping 1100 watts which provides a powerful and efficient blend to create your favourite soup. This soup maker has a 60 minute timer so you can go about your household chores or sit back and watch some telly safe in the knowledge your soup will automatically be cooked to perfection. Ideal for those on a budget and who want minimal effort; we think this is one of the best soup makers for students to make sure they eat their greens. If you just want an easy-to-use soup maker that won’t let you down then we recommend investing in the Salter Electric Soup Maker. Featured on ITV’s This Morning; this soup maker boasts high capacity and an intuitive interface of only three settings that provides an easy way to use up all your leftover veggies to create delicious broths. This is a smart soup maker that can be left alone without fear of overspill or burning, so if you don’t consider yourself a master chef, this gadget allows for minimal effort from start to finish. If you like to get ahead with your week by cooking in bulk then the VonShef Multifunctional Soup Maker is a great way to quickly rustle up a mixture of healthy meals. Not only does this gadget make soup in as little as 20 minutes, it can also be used to steam vegetables, boil eggs and make smoothies and sauces. The large capacity can make around 6 servings which is great if you enjoy hosting dinner parties or cooking for the family. If you make soup on a regular basis then the Tefal Easy Soup Maker is a hassle-free, intuitive model that will provide excellent results every time. Its compact, jug-like design means it doesn’t get in the way and makes it easy to decant your soup without making a mess. You’ll get a handy recipe book so you can try out new flavours and its medium capacity is just enough to feed a family of 4. Many customers have stated how easy-to-use this product is which is great for those who want to try to be more adventurous in the kitchen, but if the one on This Morning was a little out of your price range, this is the next best option for you. If you often find you’re left with masses of leftovers when making your lunch or dinner, then the Morphy Richards Total Control Soup Maker is a must-have for your kitchen. Whether you live alone or need to prepare soups with specific dietary requirements in mind, one portion may be all you need. With its unique portion control function, you’ll be able to tailor your cooking to your lifestyle. We also love this soup maker for its sleek white design that would look great on any kitchen countertop.